Similar to any other metal objects, aircraft are prone to corrosion. In only a few years, this problem can render a plane "unairworthy." As a general preventive measure, therefore, corrosion inhibitors are often applied on the surfaces of the metals used in building aircraft before assembly. Such actions notwithstanding, nature takes effect at some point. The rate at which the corrosion develops is highly dependent on the environment in which the plane is used, and how it is stored. 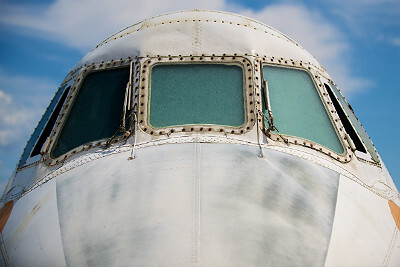 In connection with this, below is some information on the existing forms of airplane corrosion. Surface attack: The most common type of corrosion, surface corrosion leads to pitting or roughening of the metal surface. It arises as a result of an electrochemical or direct chemical attack, which may at times not be visible from the exterior. Generally, the rust spreads under and forms tiny blisters which then project on the surface. This happens in instances where the metal is not well treated prior to being painted. Intergranular corrosion: This type of rust isn't easy to detect, seeing as it occurs without producing visible signs. In most cases, by the time it is discovered, it is often too late. Aircraft parts made of aluminum alloys and some categories of stainless steel are the most susceptible to intergranular corrosion. Stress corrosion: Stress corrosion may come about as a result of applied or internal stress. When the metal is being worked on but is not shaped uniformly, for instance, stress corrosion may occur. It may also come about due to stress produced by bolts, rivets and other similar pieces. Dissimilar metal corrosion: When different metal parts come into contact with each other while a conductor is present, galvanic action may take place at the point where the two meet. This type of reaction also arises in less noticeable areas and, because of this, it is can be damaging. In most cases, several types of corrosion can be occurring at the same time. Fortunately, when such deterioration occurs, several things can be done to manage it. Preventing corrosion in aircraft requires more than just paints, coatings and the use of resistant alloys. First, continuous inspections have to be done on the aircraft to keep its parts from rusting. Whenever the paint chips, it must be fully stripped and sanded before any repainting is done. Second, lubricants and other corrosion inhibitors have to be applied on the aircraft to seal the surface and crevices against moisture. In connection with this, when the weather is humid, the aircraft should be sheltered in a location with adequate ventilation to prevent accumulation of moisture. Third, the right cleaning products should be used in aircraft cleaning. Where the wrong products are employed, the metal surface may become contaminated, and this may lead to some serious corrosion. In dissimilar metal corrosion in particular, the key to preventing the problem is to inspect adjoining parts before assembly. If corrosion is suspected, the specific parts have to be disassembled and dealt with. Lastly, mild surface corrosion can be handled through abrasion, after which a primer and paint can be applied. However, the removal should be done carefully as stainless and common steel brushes may ruin the aluminum and therefore interfere with the efficacy of the paint. Even so, where the rust is severe, the affected part has to be replaced. In general, corrosion has to be visible for it to be detected. To ensure detection, technicians are required to inspect every inch of an aircraft during servicing, repainting and other maintenance projects. Any area into which salt, water and acids can seep through has to be checked. This requirement covers the aircraft belly in addition to the galley floors, wing pockets, flaps, elevators and toilets. Heather Rhoades has worked in the corrosion field for the past 15 years. She is currently employed by a renowned New York-based cathodic protection engineering firm. She is also a public relations specialist, and lives with her partner and three children in Williamsburg, Va.